Options: Colors by request. Can also be made in wool. Personalization (extra charge). People who don’t like hats can still get cold ears. 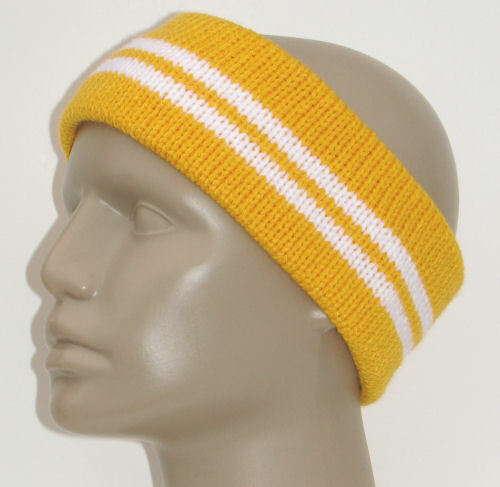 Knitted headbands are the answer. They are easy to wear and to carry; just fold up and stick into a pocket or purse. This simple design is double-layered for extra warmth. I usually make the headbands in acrylic so they can be machine washed and dried. But if you prefer extra coziness, I’m happy to use wool instead. Headbands are very sporty in school or team colors! They also don’t take up much room, so you can have several to match different jackets or coats.